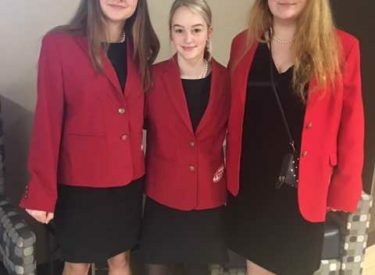 Po- Hi and East Middle School FCCLA students recently competed in the FCCLA Regional STAR (Students Taking Action with Recognition) Event held at Canadian Valley Career Technology Center. Madison Ailey and Kally Horn from East Middle School placed third in Junior Interpersonal Communication Skills. Selena Mireles from Po-Hi placed first in Senior Children’s Literature and advanced to the State Competition to be held in Stillwater, March 26-28. FCCLA stands for Family, Career and Community Leaders of America and is a nonprofit national career and technical student organization for young men and women in Family and Consumer Sciences education in public and private school through grade 12.